WASHINGTON, D.C. -- Americans continue to have significant concerns about retirement, with almost half of those not yet retired -- 46% -- projecting they won't be financially comfortable when they retire. This is modestly improved from the level of pessimism about retirement in the years immediately after the Great Recession. 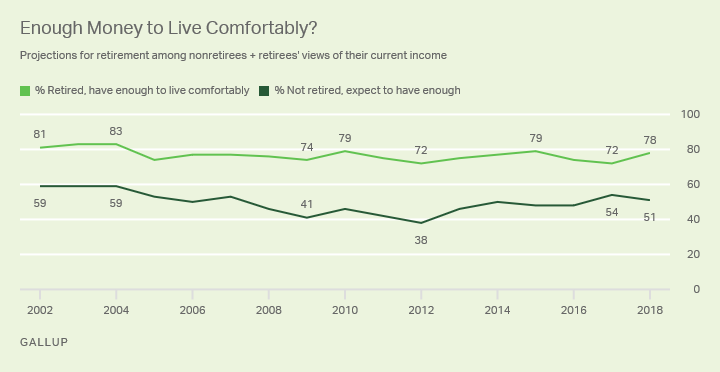 But when Gallup began tracking this measure in 2002-2004, a much lower 32% to 36% of nonretirees said they wouldn't have enough money to be comfortable in retirement -- setting a benchmark so far not attained again, despite the recovering economy. 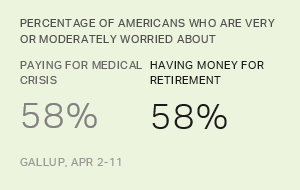 This year's April 2-11 update of Americans' attitudes about their finances also shows that financial concerns about retirement edge out having enough money for a medical emergency as the top financial worry among those not yet retired. The reports from those who are already retired, however, are more positive. In the 13 years since 2005, between 72% and 79% of retirees (including 78% this year) have reported that they had enough money to live comfortably. Retirees were slightly more positive in the first years of Gallup's trend, with 83% saying they were comfortable in 2003 and 2004. The average gap between retirees reporting they are financially comfortable and nonretirees' projections that they will be financially comfortable when they retire has been 27 percentage points. The contrast between the anticipated financial discomfort of nonretirees and the more positive reality reported from those who have retired can reflect a number of factors. Current retirees may be more likely to have pensions than those still working; may have saved more in their early years; and are likely to be enjoying Social Security benefits that have been essentially unchanged for decades. Once Americans retire, they may also learn to be frugal and get by comfortably on less than they thought would be required. For their part, nonretirees may be estimating that the Social Security system will have its own financial problems going forward; may worry because they have no personal pensions; may be pessimistic about the nation's economic future; and are subject to a consistent message from financial experts that Americans are not saving enough. Additionally, those not yet retired are projecting in some cases a future that is decades away, while current retirees may in some instances have retired decades in the past. An analysis of data from those who were relatively close to retirement in 2002-2004, and from those of the same age group who are now retired, a decade and a half later, underscores the conclusion that people become more optimistic about their finances once they retire. 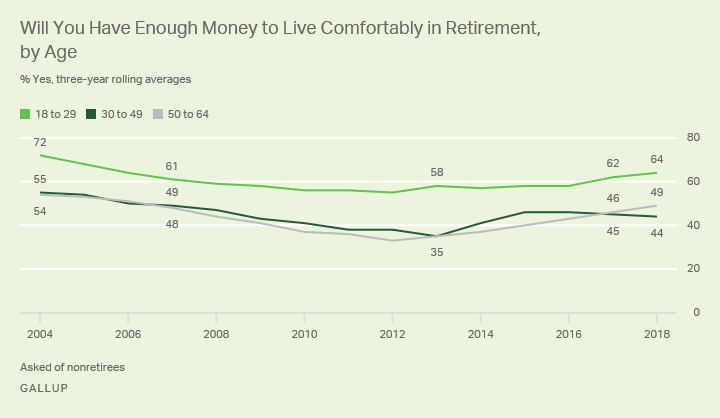 Some 54% of 50- to 64-year-old nonretirees Gallup interviewed in 2002-2004 said they would have enough money to live comfortably once they retired. 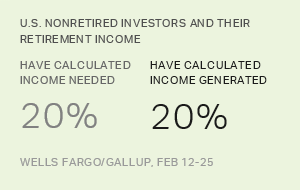 Sixteen years later, when Gallup interviewed retirees in roughly the same cohort, now aged 65 to 80, 77% reported that they did have enough money to live comfortably in their retirement. The future of one's retirement is to some degree unknowable, of course. It may be that 15 or 20 years from now, retirees will not be as well off as current retirees. This would be the case if, for example, the Social Security system was to have major problems, or if the nation's or the world's economy was in in a major recession. But over seven in 10 retirees have reported over the past 1 ½ decades that they have enough money to live comfortably. This, compared with the significantly lower percentages of those who are not retired who think they will have enough money, suggests that retirement may not be as challenging as Americans think. Retirees' generally positive assessments of their financial comfort are not universal. About a quarter of retirees in combined 2016-2018 polling report having financial issues, and this remains a point of concern. As would be expected, income is the major correlate of financial comfort in retirement. Financial discomfort is highest among the group making less than $30,000 a year, but is still far from universal. Fifty-four percent of those making less than $30,000 a year over the past four years report that they don't have enough to live comfortably. For retirees making $75,000 a year or more, financial comfort is nearly universal, and over eight in 10 of those making $30,000 to less than $75,000 are comfortable in their retirement. 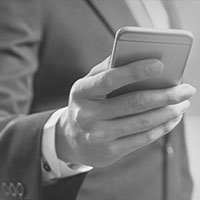 These data confirm findings from the Wells Fargo/Gallup Index of Investor Optimism showing that retired investors with $100,000 or more in investments are much more positive about being able to maintain their preferred lifestyle than are those who have much lower levels of investment. Even as the projections for comfort in retirement have fluctuated since 2002, the percentage of Americans 18 to 29 years old who say they will have enough money to live comfortably has been 16 to 17 points higher than among nonretirees aged 30 to 64. Further analysis of these data make it clear that young people interviewed 16 years ago were more positive about retirement than are the people born in roughly the same years and interviewed today, some 16 years later. It appears that a harsher reality sets in when Americans age into their 30s. There are only small differences in projected financial retirement comfort between nonretirees 30 to 49 and those 50 to 64. Apparently, once Americans move into their 30s, their estimates of their projected retirement resources begin to solidify. Americans' projections about having enough money in retirement have not yet recovered to where they were at their high point in the years before the Great Recession. This leaves almost half of nonretired Americans -- and an even higher percentage among those 30 and older -- holding the belief that they won't be able to live comfortably once they retire. 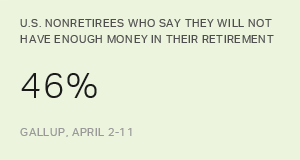 But Gallup over the past 16 years has consistently found that those who are already retired are more financially comfortable than the projections of those not yet retired would seem to indicate. No one knows what the future will bring, and retirement may not be as financially positive in the future as it has been for retirees Gallup has interviewed on a yearly basis since 2002. But over this 16-year period, the positive views of retirees appear pretty consistent. One reason retirees are positive about their finances may be that they can get by on less money than they thought. The significant majority of retirees who have incomes of $30,000 or more are financially comfortable. Only below the $30,000-a-year level does financial discomfort reach the majority level. Whatever their future holds, the Gallup trend shows that even in the "good years," more than 40% of nonretirees have been pessimistic about retirement. One virtue of this ongoing level of concern may be to spur Americans to save more, spend less and plan more diligently -- all potentially leading to a more pleasant retirement than they might have anticipated.